Anekal, Bengaluru - 562 106. Shirdi Sai Engineering College, Bengaluru, established in the year 1997 by MJF.Ln .Leo Muthu, Chairman of Sapthagiri Educational Trust, is a non-Profitable,and non-minority institution. Located within the Bangalore city limits, SSEC is an inspirational place to study in which everything from classroom to laboratories, hostel to cafeteria is state-of-the art. The labs and other facilities, are among the best in the region making it one of the most sought after institutions by parents and students. The Ultra modern computer labs with latest software and hardware make it a learning heaven for IT enthusiasts. Teaching rooms and work areas are well furnished and equipped with modern up-to-date facilities. Shirdi Sai Engineering College has developed into a reputed Engineering Institution with ISO 9001: 2008 Certification. Sri Sairam College of Engineering, Bangalore offers various graduate courses as well as Post Graduate courses. Sri Sairam College of Engineering, Bangalore is affiliated to Visvesvaraya Technological University (VTU). 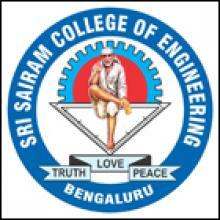 List of facilities available at Sri Sairam College of Engineering, Bangalore for students. This page was last modified on 8 October 2016 at 15:10.